Simply cut out the ladybird shapes from the red card. Cut out heads from the black card and stick on to the bodies. Draw a line down the centre of each ladybird body. Then cut out lots of black circles. 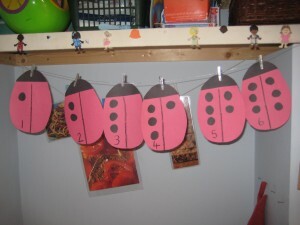 Work with the children to count and stick one circle on the first ladybird, two on the second, and so on. Help the children to write the correct number on each labybird and see if they can arrange them into ascending order. Stick them up somewhere prominent – you can use tack or string and pegs. You can refer to the ladybirds to help you count – perhaps to work out how many cups you need to get everyone a drink. Or you can use them for number games. Pick a ladybird to start with and see if your child can count on two more. Pick another ladybird and ask your child to work out what one less would be. Ask each child if they can find the laybird which has their age number on. Simply having the numbers written down where your child can view them regularly will help them to become familiar with them – and soon they will be spotting them in other places too.